In the 800s and 700s BC, Corinth was very wealthy from trade and from selling their perfume in little fancy pottery jars. Corinthian traders also sold the jars themselves. 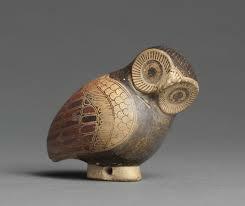 But by the late 700s BC, the Athenians had begun to make fancy pottery too. There was a lot of competition between the two cities. In the end, by about 550 BC, the Athenians had pretty much taken over the fancy pottery industry. Now that they couldn’t make a good profit, Corinth stopped producing fancy pottery to sell to other countries. But even without the pottery business, Corinth was still an important port, and remained a wealthy city. Some of the first evidence we have for tyrants and hoplites comes from Corinth, about 650 BC. Corinth never developed a fully democratic government, but by the 400s BC there was a sort of constitutional council that ran things. To show that Corinth was an important city, they sponsored the Isthmian Games, which were like the Olympic Games. 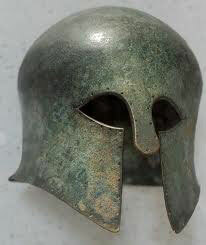 During the Persian Wars, Corinth pretty much followed the lead of Sparta, and this was also true during the Peloponnesian War, when Corinth took the side of Sparta and provided a lot of soldiers and money to the fight against Athens. After the Peloponnesian War, in the 300s BC, Corinth was involved in several smaller wars, and after Sparta collapsed Corinth even became the leader of her own alliance, the Corinthian League. By 338 BC, however, Corinth had been conquered by Philip of Macedon, like all the other Greek cities. Cite this page: Carr, K.E. Corinth, Greece in the Classical period – a rich city-state in ancient Greece. Quatr.us Study Guides, July 6, 2017. Web. April 22, 2019.